Harry Kane and Joe Ralls. Mauricio Pochettino has come to the defence of Harry Kane after Cardiff City manager Neil Warnock hit out at the Tottenham striker's reaction to a challenge that earned Joe Ralls a red card. Ralls was sent off for a reckless lunge on Lucas Moura - described as "soft to say the least" by Warnock - during the second half of a 1-0 defeat for the Welsh club at Wembley on Saturday. 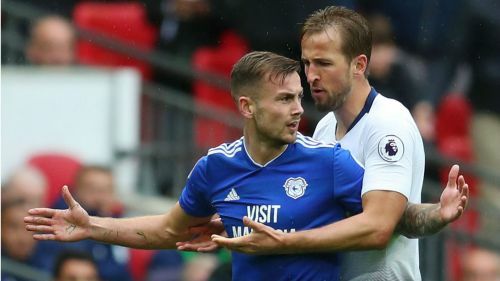 The Cardiff midfielder was immediately confronted by Kane after making the ill-judged tackle, before referee Mike Dean reached for the red card. But Warnock feels Kane's reaction influenced the decision and suggested the England captain himself could have been sent off. "Mike Dean doesn't need influencing, he's a top referee," said Warnock. "He should have gone with his instinct and shown a yellow card like he was going to. I don't think it helped being surrounded by about 15 white shirts. "He [Kane] is doing that to make an issue of it, to make the referee think it's worse than what it is. "I don't think you need somebody… England player? Going off like that? Dear me. "He ran straight in and pushed him, didn't he? Why not give him a red? "I don't think he needs to do that. He plays for England, I love him. I think he's a tremendous player but I don't think you should try to get other pros sent off. "Just because he's having a poor game and Spurs are having a poor game. He shouldn't take it out on us." Pochettino, whose side edged their visitors thanks to an eighth-minute Eric Dier goal, brushed off the incident when Warnock's comments were put to him. "We cannot take seriously what happened in that moment on the pitch," said Pochettino. "I think it’s his passion and he's so expressive. "It's part of football and for me he's someone that I respect a lot as a person and as a manager. "But if we were in [Cardiff's] position, we would complain the same as them [about the red card]." Tottenham: Can Spurs really thrive without Harry Kane?